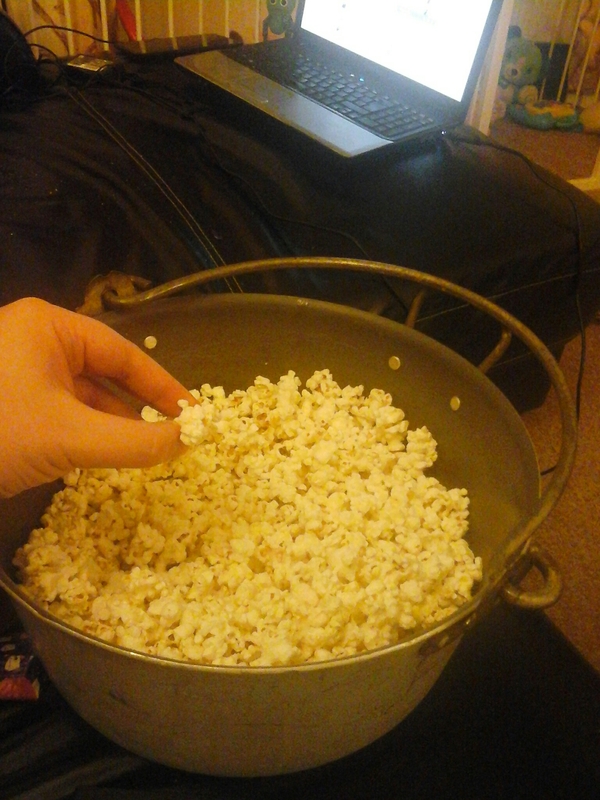 I managed to finish the rest of that pop corn today which was cool and filling. I got some nacho chees powder to sprinkle on the next batch, and I am thinking about getting experimental with popcorn now. One of my teeth has been giving me problems recently. There was nothing wrong with my teeth before the dentist fiddled and now I need two taken out… yes… two. The first is a wisdom tooth which to be fair I crushed anyway by accident having a dream but didn’t hurt and only started killing when the dentist tried to fix it and put a massive whole it it and was like… uhh… its too broken… and i need a hospital for that. Now the other one that was getting repaired has an infection and has to come out and they are putting a fake one, so that will up my total to one and a half fake teeths, which I am calling my bionic tooth because it will be better than the rest, it got me thinking about how they could adapt the tooth to make it more special like robot tooth man or something. If you think, you could have an extra setting to your tooth, a little like how in some cases a robot hand might be better than a human hand in some ways. So for instance if i were to cher, and then using a bluetooth (haha get it?) Device would pick up the readings of what i chewed and how healthy it is. Also, putting a transmitter in it to record and broadcast all the conversations – although thats flawed on the basis that your lips make ps bs and fs so it would only pick up how you would expect skellitor to speak like if you just met him. The other thought is maybe i could have it a different colour to my other teeth to make it look like a fashion accessory so was done on perpose. I could be like goldie but with rainbow teeth instead. I’d be known as the guy with the rainbow grillz. Or even have like a tattoo or a logo onto it. Anyway yntil next Thursday i am to be in pain. Growl. So… uh… I put too much corn in the bowl you see and after the microwave did its thing there was loads of pips left so thought… meh, let’s keep it going. Turns out that happened 3 times before I felt that the remaining unpopped corn was at a low enough level to leave til next time. This is the biggest container we possess. I applied for a job today along with actually having chance to rest. I’ve been trying to do the podcast editing all week and not had chance to finish it and it might kinda be too late now to release so might save it. Way too much on over the last week and tomorrow… its a fresh nothingness week. However I do have the dentist tomorrow for an emergency thing. My tooth has been killing all day yesterday and some of today but it actually feels like its calmed down quite a bit now, but I should still go anyway because it really hurt. Today’s bus trip is as yesterdays but this time my sound track is Shaun Lee’s Ping Pong Orchestra which i always find is a nice listen if you want something different. At the time of writing I’m on the way to the uni again to turn up stylishly late, however not with milk in my hand this time or I will be too late. I seem to have passed my love of milk to Ruby who always asks for it when she comes round. I had a weird dream about milk last night. Picture this with lime in the coconut by Harry Nilsson which is currently in my ears and seems to capture the strangeness. So it started off with noticing giraffes in a far away field with friends, and then for it to be joined by other animals. According to the news report they all escaped from the zoos everywhere. Apperently the animals could have escaped from the zoo previously but they didn’t because they didn’t try and were uncatchable now because they were unwilling to be captured like before. Then extinct animals started showing up everywhere. They didn’t seem to get in the way but all the animals were acting strange. Then strangely the scientists realised that they were all going to back to being reptiles and then dinosaurs started showing up dotted around. Then there was a news report (after these situations were brought under control) that the human race was at risk as milk that was squirted at the cow that produced it was infected by a life form bacteria from the start of life and it turned the cow green and mad and dangerous and it was happening to other mamals that consumed or came into contact with it (a youtube video I saw in this dream showed a cat change green and start meowing like charlie from the old public information films). Things started to get really messed up at this point and i woke up. So it’s later now and yesterday i said I would explain what was going on with going to uni. I was helping out on a show called After The Tone which had it’s first recording today. It’s a panel show and I helped with making up some questions. It was pretty good. The idea of the show was to do games from certain panel shows and sometimes with a twist. It was part of someone’s course work for independent production. It was nice to go back and help out, and really cool to see Robin again who came to be in the audience. We had a drink after and caught up which was cool. I need to remember to call him on Monday and see if Mr Jelmer icn talk at some point. I managed to achieve my obligatory weird face qouta today too when I ordered an Apple Sourz and Coke… by the guy at the bar and the four people I was at the bar with until litterally everyone (besides the bar guy) tasting the drink, agreeing it was nice and then finally getting to drink the drink that was by that time a whore drink. Ok so picture this… me (overweight guy – mostly in the stomach to be bluntly honest – brown hair, not too long but a little shaggy now, slightly unshaven, thick black and red glasses, face a little like when you mix a pug and a frog if you remove the glasses – forgetting about the colour right now because we aren’t racist) sat on a the top deck of the stagecoach gold bus (the ones with leather seats – yes Swindon people the “posh” ones). Today I’m off to my old uni to help plan a panel show happening tomorrow, but to finish off the mental image, my clothing. 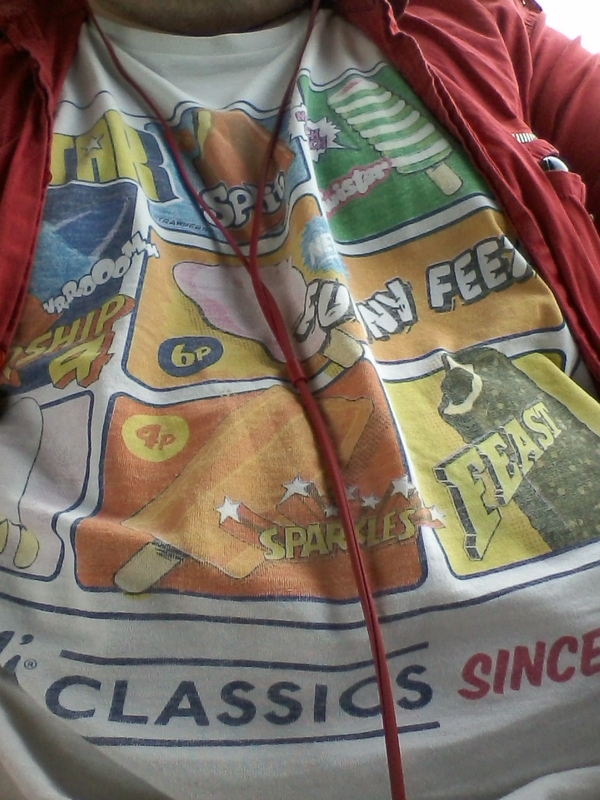 I’m known for having interesting shirts mainly because I’m no extravagant dresser but like to be ‘me’… so the shirt of choice today is the walls classics lolly tshirt (as below) with my really old red shirt. I might look standard if it wasnt for the wine coloured backpack, wine coloured headphones, red converse and white shorts. To top it off I have erasure – sometimes pumping through them but visually I match! Today was fun. I will explain tomorrow! So right now I’m watching the debates. I shalt say anything about my views on it, I’m a media person and don’t believe in airing my political opinion, however every time a certain one opens their mouth it makes me cringe so much. Also, wouldn’t it be interesting if you could vote for Scotland and Wales in England and if they won, that england could be controlled from Scotland. To be honest the debate in our house is what to have for dinner… its kind of a negative debate really, theres no enthusiasm, especially on my part. Maybe we need a dinner dictator. If it was a thing it would be one of those big text thing of red leds saying “YOUR DINNER TONIGHT WILL BE…” and then it tells us. I didn’t put a dinner example by the way due to not knowing, but so far it’s wotsits. Today has been a non-mover. I really achieved nothing, or very little. I’ve just kind of either been doing other stuff or in the end, just couldn’t get into it. Tonight… well last night we watched The Flash and the night before was Arrow… more tonight, and maybe even some Gotham! So I woke up this morning with like a sand paper feeling on one of my teeth. Turns out I have either chipped it or i ground it while I slept. Either of the two isn’t cool. Its nothing mega, its one of my canine teeth. So today I’ve been catching up on the Arrow (which is an ace tv show. Watch it). I also got to smell the first freshly cut grass of the year. So far I have seen a Bee and a Wasp, and can open the windows without being cold. It’s been a cold cold winter so I’m glad things are back to warm. I just need to remember not to leave the kitchen window open and the light or otherwise wasps will invade the kitchen again. Also today Aphre was off sick. She wasn’t well yesterday either as I think she has my illness I had last week. I also managed to re-jig my radio demo again today because apparently I was a little shouty so wanted to find some other links where i wasnt so close to the mic. So today is the start of doing this again… blogging! I know a few people who do this every day, and i don’t think that I have the patience to keep it up for a proper loooong time. I say that, but to be fair I’ve been doing the blog for nearly 10 years (in september). The plan is to do it for 30 days and then hopefully carry it on, but we’ll find out in time. Right now (thanks to the magic of wordpress) I will be in uni and doing a meeting to do with the longest podcast and hopefully not the worlds longest meeting. Remembering my final year, it was a constant meeting (as is probably documented). This longest podcast will be a challenge and will also be a huge learning curve I think regarding publicising things and doing business. I recon if i do good at this I should do the apprentice. Maybe not. I probably wouldn’t get in because I would be ace at the tasks and would do all of them correctly and they might want anyone who is actually good because it’s not entertaining enough. Also due to my lack if business sense. Scrap the whole idea. So sice the last update, here is what’s gone down in life and shizzle! At the end of March I went up to get madam Rhubarb, and she spent a week over mine which was funtimes. We made some animations with playdoh which was fun. That was mainly because we went to the media museum and saw hoe they made shaun the sheep, and decided to make our own. We had all sorts of fun including a picnic with Aphre and Finn, and my mum, sister and niece which was fun. It was indoor due to the rain and being a bit chilly, but we all had an easter egg hunt which the kids seemed to enjoy. There was a little trouble when it was time to take Ruby home because my bus was overbooked and there was no spaces left, and to be honest I was really ill anyway so even if the bus problems hadn’t happened I probably wouldn’t have been in the state to travel anyway. Going on busses and trains make me really tired and sick sometimes but I do it so I can see my little one and always worth it and would go even half dead. I’ve mostly recovered from that now, just the tail end of a cold. It’s weird, it came on mega quickly overnight and i woke up feeling properly sick. The only problem I seem to have is Tendonitis again which I think may be down to lugging a baby and buggy up and down the stairs. I’ve also decided that in order to give this blog a boost again I’ll be doing it daily from monday 13th of April to the 13th of May and then see how long I last for after that. It’s been a while since i did it. Today was really nice, it kind of was adventure. It was nice. We’re having Finn’s birthday party on his birthday so Aphre and I took the form to the place it’s happening, and then went for a walk to the park. We all had some nice pictures and a swing on the swing. It was really nice. I love my Aphre billions. Tomorrow the plan is to make a new demo as feedback from thenlast one said I was a littke shouty. Plus ive heard some clips of shows I’ve done that actually are quite funny and might be good for getting me work as a presenter, i just need to fine some good presentery reading bits that dont sound too loud. Right… time to watch something on tv… so far there is nothing on. Tru tv is ok, but kind of spooky. I’m not mega keen on watching mexicans glue skulls back together.